240 Units of SOCKS'NBULK Women's No Show Socks, Soft Sports Socks Solid White Size 9-11 - Womens Ankle Sock at low wholesale prices. alltimetrading.com offers Womens Ankle Sock at bulk discounted prices. PERFORMANCE SOCKS: Whether you’re going to work, playing sports, exercising, or just taking a stroll, these sport socks are the perfect pair. These socks also help to draw moisture away while keeping your feet cool and dry. Thick cushioning gives you extra shock support while running and playing high impact sports Wearing the right socks when you work out gives you that extra support you need so you can get a great workout. SPORTS SOCKS: Get a value pack of a low cut sport no show socks ,perfect for the gym or running outdoors. Keeps your feet comfortable and dry and has a nice amount of stretch. CARE: Easy to care for just toss in the washer/ dryer , very durable and can hold up through many washes. Breathable light material keeps your feet fresh all day. MATERIAL: Made with 80%Cotton 15% Polyester 5% Spandex for a great stretchy fit. 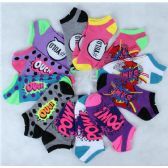 Women’s sock size 9-11 fit women with shoe size 4-10.